Vaermina is an enemy of Ebonarm, Boethiah, Peryite, and Hermaeus Mora, but is allied with Sanguine. Her summoning day is the 10th of Sun's Height. Although historically it is Molag Bal who contrite vampires turn to for relief from their curse, Bal must solicit Vaermina for the actual cure, though the particulars of this transaction are unknown. In 16 Accords of Madness Sheogorath taught Vaermina about the importance of madness for dreams. The Skull of Corruption is Vaermina's signature artifact. It is an incredible staff that creates a duplicate, or "clone", of whomever it is cast upon. This clone then attacks the original at the behest of the caster. Legends say that the staff a mind of its own, and can feed on the memories of those around it. There is a story about a Thieves Guild Master and the Skull that is probably fiction, but highly amusing. The Master used the Skull on her enemy, creating a clone of him to fight. After defeating the original, the clever duplicate snatched the Skull from the Master and used it on her. Although the cloned enemy could not directly attack the Master, it could use the Skull to create a duplicate Master. The two clones jointly ruled the Thieves Guild for years. Quagmire, or the Dreamstride, is a realm of Oblivion, created and ruled over by the Daedric Prince of Nightmare, Vaermina. It is a realm of horrors, where reality shifts upon itself in seemingly impossible ways. Every few minutes, lightning flashes and the realm morphs into a terrifying scene, each one more frightening than the last. It is the realm most often visited by mortals. 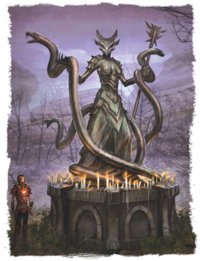 From her citadel in the center of the realm, Vaermina reaches out into Mundus and collects the memories of sleeping mortals, leaving nothing but visions of horror and despair. These experiences, known as nightmares, involve the mind of a mortal traveling to Quagmire. Through magical teleportation, it is possible for a mortal to enter Quagmire while awake, as was done by the mage Morian Zenas. For game-specific information, see the Daggerfall, Oblivion, and Skyrim articles.